We are a leading Manufacturer of Dry Bulb RH Controller, Humidity and Temperature Controller, Humidity and Temperature Controllers, Humidity Controllers and Clean Room Indicator from Mumbai, India. RH-T Controller, HTC96 is a ON-OFF controller designed for relative humidity & temperature control applications with a humidity range from 0 to 100% RH and a temperature range of -20 to 100° C. It receives input from Radix's SHT20, SHT30 (wall-mount) and SHT40(duct-mount) RH+T sensors which must be ordered separately and may be placed up to 50 meters from the unit. HTC96 features a two-color dual LED display; the upper indicates relative humidity and the lower, temperature while two additional LEDs indicate the status of each relay. Operators program up to 2 set points via membrane buttons on the front of HTC96. This controller has an accuracy of ± 2% RH and ± 0.3° C. HTC96's electromagnetic relays trigger full-scale Hi and Lo alarms. It transmits one isolated output signal (either temperature or humidity) to other devices such as a Programmable Logic Controller (PLC) or Solid-State Relay (SSR). Signal isolation protects your devices and machines downstream of our instruments from damaging fluctuations in the input signal. This product features Radix's proprietary sensor-break indication technology. Temperature Indicator and Controller, HX96A is a ON-OFF controller designed for relative humidity and temperature control applications with a humidity range from 0 to 100% RH and a temperature range of -20 to 100 °C. It receives input from Radix's SHT20, SHT30 (wall-mount) and SHT40(duct-mount) RH+T sensors which must be ordered separately and may be placed up to 50 meters from the unit. HX96A features a two-color dual LED display; the upper indicates relative humidity and the lower, temperature while eight additional LEDs indicate the status of each relay and communication status. Operators program up to 4 set points via membrane buttons on the front of HX96A. This controller has an accuracy of ±2% RH and ± 0.3° C. HX96A's 4 electromagnetic relays trigger heating, cooling and full-scale Hi and Lo alarms. It transmits 2 isolated current or voltage output signals (either temperature or humidity) to other devices such as a Programmable Logic Controller (PLC) or Solid-State Relay (SSR). Signal isolation protects your devices and machines downstream of our instruments from damaging fluctuations in the input signal. This product features Radix's proprietary sensor-break indication technology. 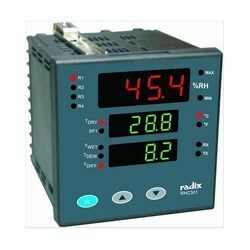 RHC 201 is a Humidity Controllers that uses wet and dry bulb temperatures to measure and display RH. It receives two 4 - 20 mA or RTD inputs for wet and dry bulb temperatures within the range of -20 to 100 °C. A large two-color LED dual-display on the front of the RH controller indicates calculated RH in the upper display and in the lower either of the set point, Tdry, Twet or the difference between the two bulb temperatures. 6 additional LEDs indicate the status of each relay and the parameter in the lower display. Operators program up to 2 set points easily via membrane buttons on the front of RHC201. The controller has an accuracy of ± 2 RH with a Class A Pt100 RTD and ± 0.5 RH for linear input. RHC201’s electromagnetic relays trigger humidification (heating), dehumidification (cooling), or any of six alarms - full-scale high and low, deviation high and low, in band and out band. The Clean Room Monitor Hawkeye from RADIX offers state-of-the-art technology solution for Relative Humidity,Temperature and Differential Pressure indication for Clean Rooms.